You bought the thing, and now you’re anxious to get out on the road and do some camping. The thing is, the camper is sitting on jacks, on blocks, on the ground. It’s up to you to load it on the pickup so you can go. Don’t panic–it’s not all that difficult to load a camper on a pickup. Take your time and enlist some help if you can find it. Line up the bed of your pickup with the camper box and slowly back under the camper. You may need to take several shots at this, because it is very important that the camper sits evenly in the bed of your pickup. Make certain that the camper does not rest on the rails of your pickup bed; something will certainly crumple. If the camper’s box does not clear the sides of the bed, build a frame of lumber to lay in the bed of your pickup to raise the camper box. Ease the pickup under the camper. 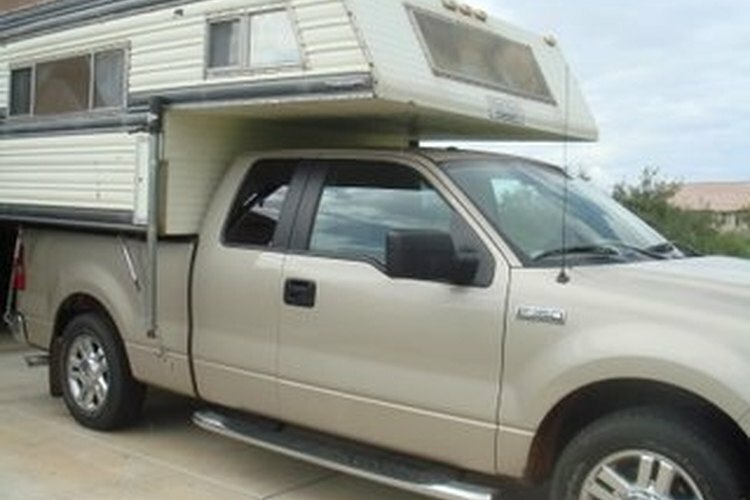 Begin to take the camper off its jacks so that it rests firmly on the bed of your pickup. Begin in the back; slightly release the two back jacks in equal amounts, then move to the front and drop both front jacks in equal amounts. Return to the rear jacks and release them a bit more, then up to the front. Continue working evenly, back to front, until the camper's entire weight rests on your pickup bed. Connect tie-downs to secure the camper to the pickup. The best system consists of installed tie-down brackets on both the pickup and camper, linked together with turnbuckles. If you have not yet installed a tie-down system, use nylon ratchet straps to hold the camper down. Tighten your tie-downs until they’re snug but not tight; it’s best to give your camper a little bit of wiggle room. Connect the lights from the camper to your pickup. Properly installed running lights make you more visible on the road. Check your tire pressure and adjust it to suit the weight of your camper; the load will change the way your pickup rides. Close the camper windows and close and lock the door to keep weather out and all your stuff in. Drive safely; take time to get comfortable driving this new rig.